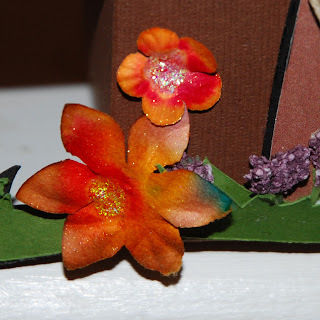 CardMonkey's Paper Jungle: Disney Pixar Blog Hop: A Magical Journey! Note: This posting has been revised to include both the Disney Pixar Blog Hop #1, as well as the Disney Pixar Blog Hop #2. Comments #1 - 203 were on the first Blog Hop; Comments # 204 and higher are from the second Disney Pixar Blog Hop, and later. This was modified to accommodate a hop posting snafu, to avoid broken links. Sorry if this causes any inconvenience!! 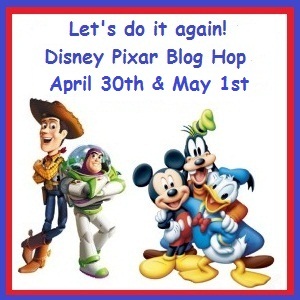 This posting was made on Day #2 (May 1, 2011) of the reprised Disney Pixar Blog Hop. 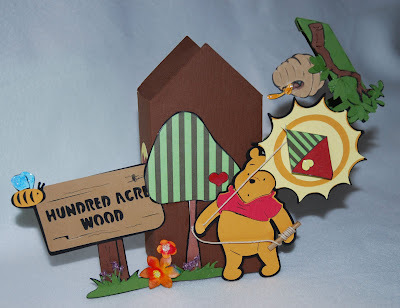 While I am not an official stop in the line-up on today's portion of the Hop, it has come to my attention that some visitors were inadvertently linked to my first (March 26) set of Disney projects, not my Pooh Treehouse made especially for April 30. So I'm reprising my reprise! LOL! And as a special treat, I'll briefly show my projects from Hop #1 as well -- so we're all caught up. Like the first version, this hop is co-hosted by my "pixie Sistah" Shawn at www.craftychicsblog.blogspot.com and Melissa at www.disneydreamerdesigns.blogspot.com. These two lovely women are Disney fanatics and two of my very favorite friends. Kudos to them for organizing this great hop! To make this "treehouse," I used an SVG Cuts birdhouse box as the base, cut in brown with a green roof. This cutting file shows the birdhouse with birds and flowers decorating it ... I like to use it as a base, and come up with my own designs for the embellishment. The birdhouse opens (which I'll show later), so I could stuff this with gift items, tickets to the movies or DisneyWorld, candy, etc. I used Cricut's Pooh and Friends cartridge to cut Pooh, the Hundred Acre Wood sign, the sun and the tree branch. Everything was cut at 4". For the tree with the striped pattern, the kite and a window on the left side (hidden), I cut pieces from one of my favorite Nikki Sivils Scrapbooker LLC papers called "We Are Family". Below are a few of the fun details of this project. Here is how the box opens up -- the roof comes off, with its embellishments firmly attached. Here are a few of the little details that make this special, I think. 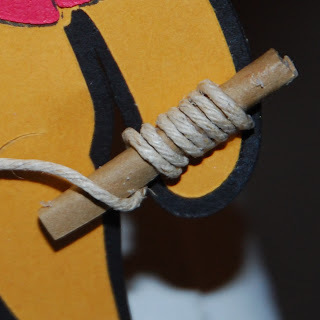 Pooh's kite string is wound around a paper "stick". CardMonkey Glimmer Mist (homemade) and Stickles. Trimmed in dried lilacs in the grass edge. Now how about a little BLOG CANDY: I've bought a sweet EK Success Disney 12x12" scrapbooking kit for the winner of my blog candy. 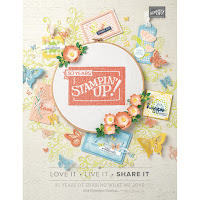 It contains 121 pieces including 6 sheets of patterned Disney papers, a sheet of glitter alphabets, 2 sheets of dimensional stickers, and pages of decorative borders and elements. ADORABLE!! Be or become a follower of the CardMonkey blog! This is mandatory, and I do check. I put a lot of work into my projects and $$ into my blog candy and its shipping ... it's really the least you can do! 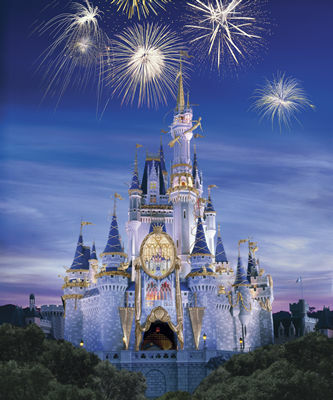 Leave a comment here, and answer this question: What is your favorite Disney movie? Please include a way for me to contact you in the event you win the blog candy. Don't forget to look for the Hidden Mickey on both Day #1, and Day #2. 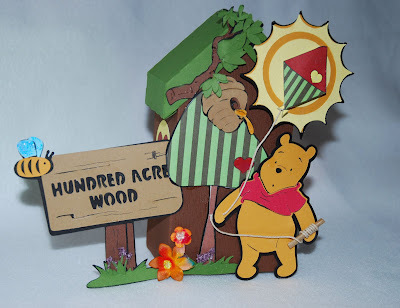 Follow the instructions on Shawn's posting as to where to leave a comment (reporting where the Hidden Mickeys are) to be eligible to win the Grand Pooh-bear of all Blog Hop prizes, a Cricut Gypsy! For my loyal followers who have made it this far, I'll offer a hint: on Day #1, look at the LAST stop!! Paper-pieced Mickey from Cricut's "Mickey and Friends" cartridge. "Being, or becoming, a follower on my blogsite please." "Leaving a comment on this post." "Having your name randomly selected by Random.Org from the comments posted on this post." Hmm might have to work on my mental powers to do this one. LOL just kidding. It's been nice to meet you! I'm a follower. Great projects! Thanks for the chance to win! Great Disney Layouts. I have 2 trips to scrap yet! Wonderful layouts...Love the added picture to the Tigger one. New follower....thanks for the chance of winning on this blog hop. Great projects! I really need to pull out my Disney carts and catch up on my projects. Thanks for the inspiration! Great project ideas. this is a perfect way to spend my chilly sat. morning. being inspired by all of the terrific ideas. Thank you. And I love that you called me a Pixie . . . I have compared myself to Tink in the past . . . sassy, yet classy. Thank you so much for being in this hop Sistah! Fabulous job Ellen!! !Your LO's are awesome and I love that card!! We are planning to take our 3 grandsons to Disney next year. I'm one of those scrappers.. take pictures.. file.. forget.. then when the kids get older.. "find" them. With your blog, and those of the other "Hoppers" I'm going to be Pro-Active and start those pages now! I am now a follower! Love your cards and layouts! Tried to become a follower getting errors love your cards. Love your layouts. I really do have to get playing this cartridge. I'm already a follower. TFS! Am following now and love your stuff. It is so nice to have some new inspiration!!! Love the layouts but especially the card! Now I am a follower!! fantastic ideas.. you have such a talent.. I just became a follower. Great layouts! I really like the layouts, but love the card. Simple but terrific. Loving it all Ellen! Where did you find that red with white rick-rack?? I need some of that! It just screams "DISNEY"!! ...and how perfect did that little face fit on Tiggers head?! So cute! Thanks so much for being a part of our hop! Love the card, and the layouts are wonderful. You have amazing talent. 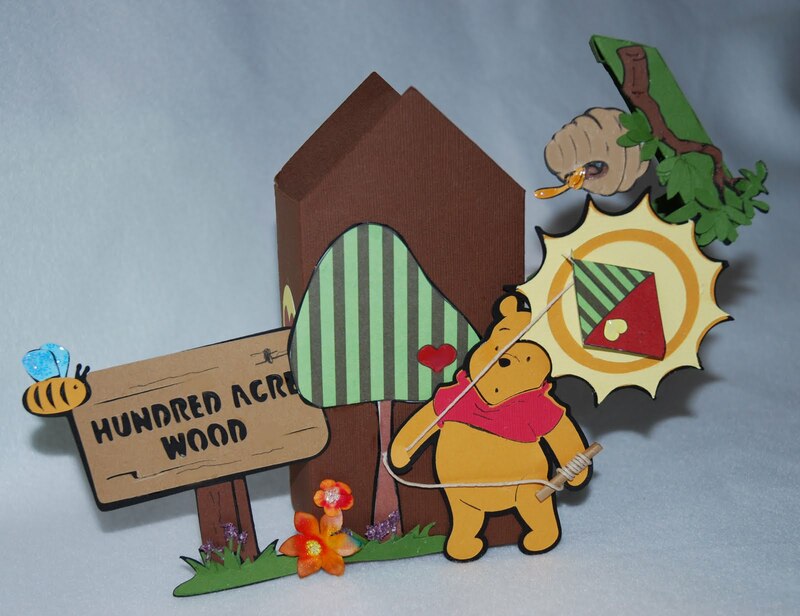 Cute Mickey card and love those scrapbook pages especially Tigger. I'm a follower. Great card! I love the classic characters! i'm getting some great ideas for my layouts from you girls...i have the cart and haven't used it yet. I'm already a follower of your delightful blog and who doesn't love everything disney! Love your card! Done and done! Great layouts! I'm now a follower - nice work! What a great blog hope. I really love Disney, Its always just right for the whole family. All the movies are great. I can't pick a favorite. Thanks for the fun. Your projects all turned out great. 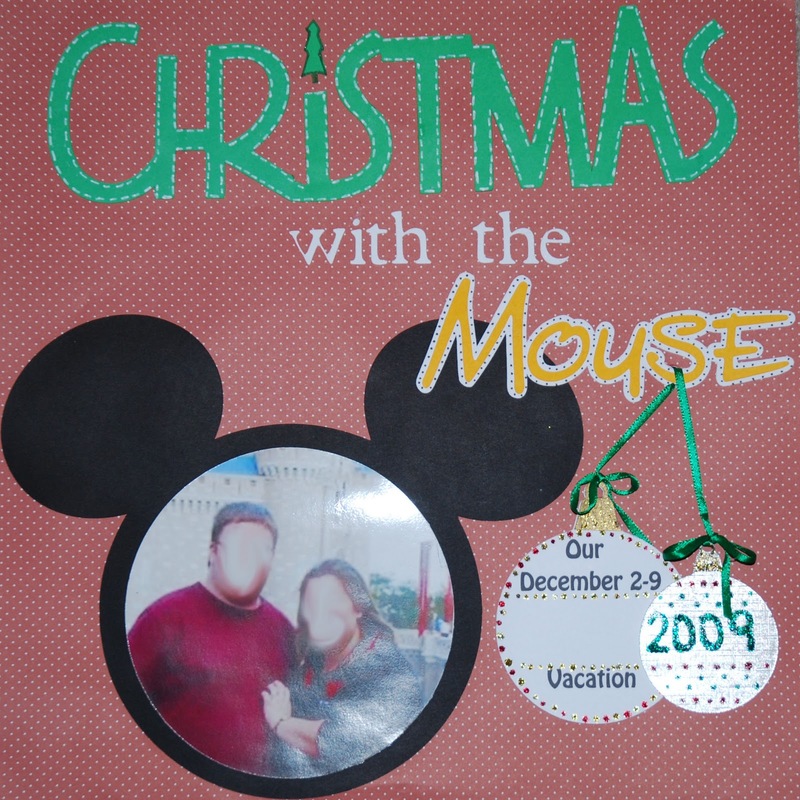 Our last trip to Disney was at Christmas time too, so we had Christmas with the Mouse also. Happy Anniversary! love all the Disney ideas. Have old disney trip pics to scrap and leaving for there in 10 days again and can't wait. Great layout and card. Thanks for sharing and the chance to win. (And congrats on the new grandbaby). Awesome card and layout!! I am now a follower. Thank you for the chance to win! I am just loving this blog hop! Great projects! Wow what great creations! I love Tigger! He was my first creation when I got my Disney Pooh and friends cartridge! Thanks for sharing! Great card and layouts! I just love Disney. Don't we all just love Disney! Your card and layouts were awesome! Makes me feel like I should get back to work on our Disney/Florida Trip. Love you stuf! Thanks for the inspiration. Wow! How much fun. Great ideas. I love your layouts. Such great ideas. Love Disney. Such cute ideas, thanks for sharing. I am already a follower. Great layouts and that card is adorable. I am already a follower of your blog. Can't wait to come back for your other Hop after I finish the Disney Hop. Happy Anniversary! Fabulous job!! Love how you blurred out Tigger's face as well. Thanks for the chuckle. Really wonderful projects! Thanks for sharing! Very cute projects. I really like them. Great projects! Especially love the Mickey card. So simple and so cute! Thanks for sharing. Great Creations! Love the layouts! Your disney card and layout are gorgeous! I love how you put a circular picture in the Mickey hat. Thank you for sharing all your wonderful Disney creations!! Love those layouts! Thank you for sharing your talent and for the chance in this blog hop! Love the ideas and the chance to win! Wow great layouts you have done!! Enjoying seeing all the different ideas out there. I love the card and the layouts! Good job! TFS! Love your projects! Thanks so much for sharing! I am now a follower of your blog. Thanks for sharing the card and layouts they are adorable. Love the tigger page you made. I love the Tigger page and everything you did-wonderful! I am now a follower! Oh those pages are awesome! The roller coaster one came out really amazing. I love them all. Thank you for sharing them with us! Love the card and the layouts are great,TFS. Fabulous projects!!! Love them all. I am already a follower, from this morning's other blog hop. Your page layouts are great. I am getting ready to do some our Disney pictures. Very good. I love the card too. I have the Cricut die to make this Mickey. I bought it for the page layouts, but he makes a cute card too. All Disney All the Time! I love it!!! Thanks for the great ideas and chances to win! I am going to the other hop, too. I did become a follower. Have a wonderful day. Love your projects. Thanks for the chance to win! Great projects!! Love Disney Stuff!!! I'm an old follower! nice projects and I have been a follower for a while now!! TFS!! Who doesn't love Disney! That Tigger is Tiggeriffic! Layouts are awesome! Great job! Thanks for a chance to win! Already a follower! I love your pages for the Disney trip. Great Ideas. I'm a blog newbie--this is my first and I love the ideas and layouts. I'm a little challenged in moving around and finding where to comment. I only own the Disney alphabet, but now I'm rethinking the purchase of Disney. Very fun! Great card and los. I am a new follower. Beautiful scrapbook picture, love your LO's. Great family pictures. Thanks for sharing. I love all of your projects! They are all so nice that it is impossible to choose a favorite! Thanks for sharing! They are all adorable, but I love the X-mas with micky. Love the layouts, so cute!!!!! great projects ! thanks for sharing. Hi, Ellen! Great projects, all! I especially love the card as that's my specialty. Thanks so much for sharing and for offering a chance to win some awesome surprise candy! I'm already a follower. Great card and layouts! Thank you for sharing and the chance to win. Your layouts are worth scraplifting. Great job. thanks for sharing. Thanks for the opportunity to win! Love the layouts and the cards!! Love your layouts!! Did you put glitter on the rollercoaster tracks on the second of your 3 pages or did the page come like that? I am a new follower, and I LOVE your layouts!! So Amazing. I still have to scrap mine from when I went to Disney World in 2008 for my birthday/honeymoon weekend! Thanks for sharing!! I love your projects Ellen. New follower - great projects - I like the mickey bday card - so cute!! I love the card! The layouts are great too! Super cute!! I am a follower. TFS! Love the cards! I've ordered my first Disney cart, can't wait for it to arrive! I really like the layouts. 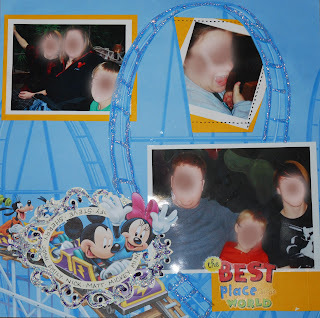 Thanks for the amazing ideas on how to incorporate the Disney characters in scrapbook pages. Every time I visit your blog, I enjoy myself :) This time was no exception - I love your projects but I also love your wit :) I am a long time follower of your fabulous blog! 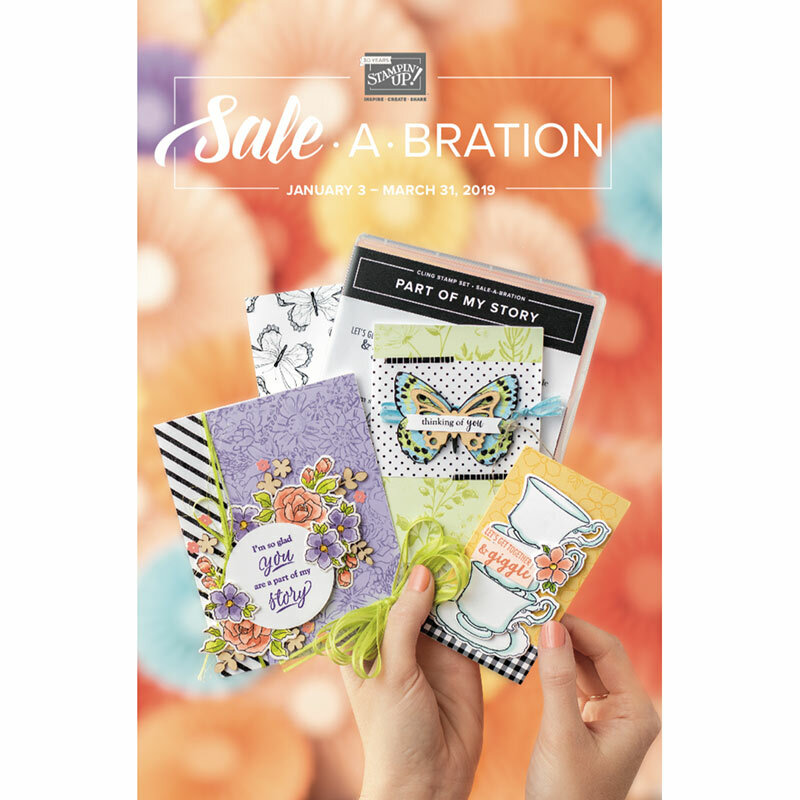 Love your card and your layout is fanastic! I just became a follower! Thanks for the chance to win! I LOVE Disney & Pixar...what a great hop and blog candy tyty for the chance to win !!!! !following you is an ez thing to do !!!! super cute LO's and your card is really cute too!!!! TFS!!! Great card and layouts! Thanks for sharing. I am now a follower. Definitely a follower -- loved, loved loved your Disney creations! Many thanks for the wonderful ideas!!! Great projects TFS!! Also thanks for the chance to win!! I am following you on Networkedblogs and google.!! Wow. Great job! I love the layout with the rollercoaster. How did you do that? Beautiful! I'm a follower (forgot to mention that earlier). Fabulous LO, Tigger is soooo cute! Really great projects! I especially love the Tigger one! Love the Tigger LO. I'm a new follower. Thanks for the blog hop and a chance to win. Oh I just love your projects for the hop, especially that Christmas with the Mouse page! Super cute!! I'm a new follower and thanks for the chance to win. love the layout. very original. Love your projects. What wonderful detail in the dot for the "i" on Christmas. Love it. Thanks for a chance to win, everyone loves a surprise!!! Super cute Tigger page. :) And I am now a follower! I like the roller coaster page...We just got back from Disney. Such a fun b-day card and great LOs. I especially like the roller coaster page. TFS! I really like your layouts. My favorite is the the Mickey head with pictures. The Tigger one is great too. Thanks for the ideas. Great layouts! Love the card!!! 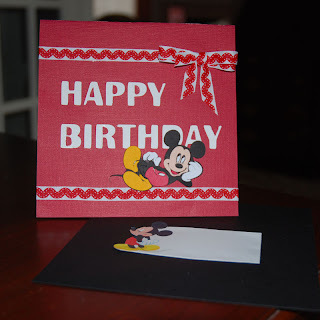 LOVE the Mickey birthday card. I still have my Mickey Mouse from when I was little, I just love him. I have just become a follower too. All of your projects are awesome!!!! Already a follower :) Hope you will check out my blog too! Love the layouts. not as much as I love Disney! Cute card and nice layouts. It was very thoughtful of you to finish them for your daughter. Just became a follower - thank you for sharing your projects with us!! The card and layouts are do cute! I love the tigger cut out face! I'm a follower, pick me! Love your card and layouts. Mickey is my favorite!! I love your layouts! You did a great job! so cute love your layouts TFS!!! I was here for the "other" hop but will have to do this one too! I'm a follower, thanks for sharing! Love your LO's Im a new follower. Loved your projects. I am a follower. You can find me at http://handmadewithlove-lisa.blogspot.com/. TFS. Great card and awesome layouts. Just wonderful. I'm a follower of your blog and I loved you Christmas layout.... too cute. Awesome projects, Thanks for sharing all of your projects. Great ideas. Thanks for sharing!!! Awesome layouts, thanks for sharing. 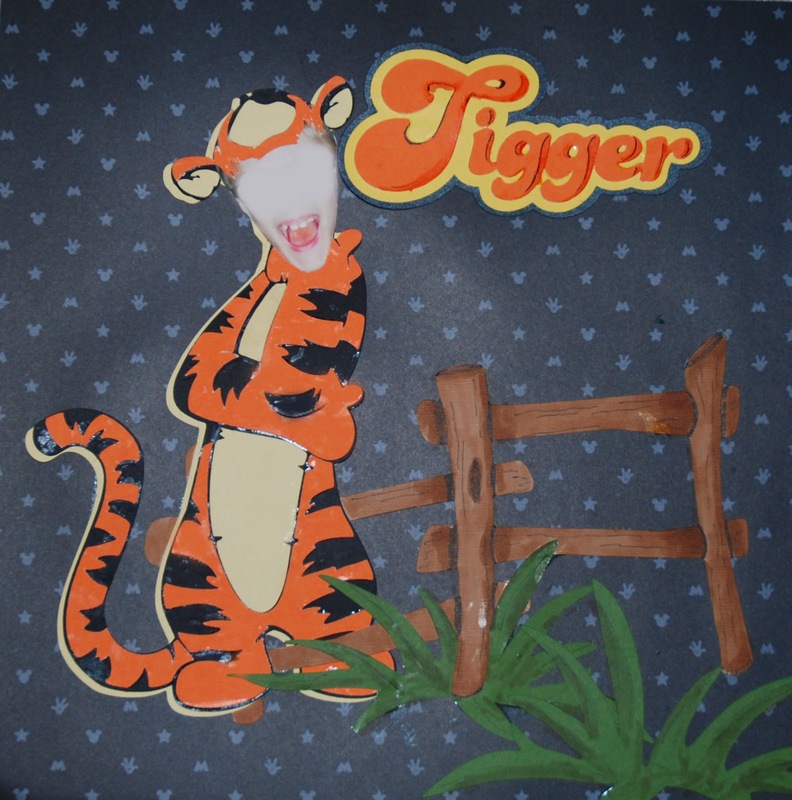 What cute projects, I love the Tigger, with the picture in the face. so cute! Cute stuff. The card is adorable and I really like the album- not overly ornate. Very cute card and beautiful layouts! Great projects, Ellen! I especially love the Mickey birthday card. I am a new follower and I can't wait to check out the rest of your blog. Great projects. Very cute LO. TFS! Very cute card and such beautiful layouts. TFS!! Just became a follower! Love your Mickey card! And, your layouts are just adorable! I just became a follower ... I love your Mickey card... it's great!!!! Love your layouts as well. I'm a new follower! Enjoyed the layouts and really love the card, great use of rickrack ribbon! Wouldn't mind winning the dandy candy. Cute, cute, cute. I love the idea of downloading the file for the tag when using a black envelope. I think I'll have to scraplift that. What cute projects. Just love the Mickey card. Great layouts. I really love the tigger one with the person's face in the cut out. I am going to have to scraplift that one for sure. Thanks for the chance to win. I follow you. Great LOs! I love Disneyland and even though I haven't been in several years, I have been there enough times I have lost track. I am a follower who can be reached by the email link on my profile. Love the LOs. Love this hop as I have a ton of photos to scrap from our trip and getting lots of great ideas. TFS I am already a follower.